The latest feature to join the Myzone portfolio is MZ-Motion, launched February 2019. MZ-Motion utilizes the phones accelerometer, which detects movement, recording incidental activity when the phone is in motion. 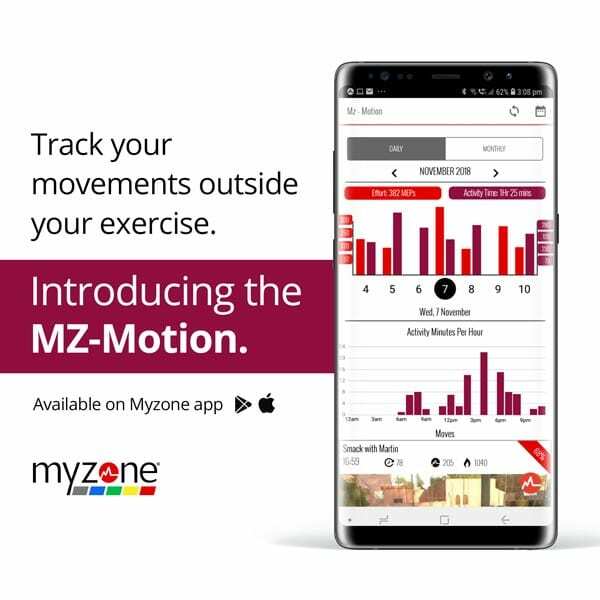 For every minute that is monitored while moving, the smartphone app will record one MZ-Motion, enabling the Myzone platform to now recognize non-exercise activity time. The new feature is designed to ensure that every move counts. However, please note that this metric does not add to the MEPS accumulation, as it is not deemed exercise, but rather movement. MZ-Motion can be found in the calendar and is presented alongside a user’s MEP activity in the Myzone App. The accurate (equiv. EKG 99.4%) wearable fitness tracker shows and rewards effort when users work out. Myzone displays real-time heart rate, calories, and intensity with five simple color-coded personalized zones. The telemetry can be displayed collectively in group settings and exercise classes, or individually direct to a smartphone via the Myzone app. The app allows engagement, motivation, and communities to flourish. Represented in over 6,000 facilities in 65+ countries and translated into 19 languages, Myzone is used by health & fitness clubs, corporate wellness sites, educational establishments or anyone wanting to track their physical activity. In 2018 Myzone was recognized by IHRSA as the Associate Member of the Year. For more information, visit http://www.myzone.org.